WOW! That was my response when I opened the box. The Flyboy has been my favorite Stauer and was excited when the Midnight hit the catalog. It took almost 6 weeks after ordering before it was released and it was worth the wait. As impatient as I am, all anxiety disappeared in a flash. I am almost embarrassed to say that it literally took my breathe away. The single most handsome watch I own, and I have almost 50 now. The pictures do not do it justice. By the way, I ordered 5 Midnight Flyboy''s. One for me and one for each of my nephews. Glad I did. The original 200 are gone and they are on back order but you will not be disappointed when you finally get it so order now. You may want to send me a Thank You card if you take my advice. Thank you Stauer! I''ve had this watch for about 2 weeks now. Great timepiece. Very accurate for the money, averages about +/- half a second in a week''s time. Tachymeter function is extraordinarily accurate over measured mile course for speed calibration. The &quot;whiz wheel&quot; bezel is a nice novelty, not much use with today''s computers, but rounds out the attractiveness of the watch. Solid construction, attractive rose gold. Two wishes for improvement would be metal watch band availability in rose gold with deployment clasp and better fitted watch hands. I''ve noticed they slide slightly. Worth every penny and the wait! You won''t be sorry if you order this beautiful, cool, functional watch! I have to admit, it''s beautiful. While I have had a bad experience with the Graves watch (hand fell off, second replacement watch the day button is becoming screwed up), this watch I decided to give a try. I am also aware that the Graves sported a china movt, and this watch sports a japanese movt. On day one, this watch seems much better constructed, solid, and sturdy. And of course, it''s one of the most beautiful watches that I''ve ever wanted to own (i''m into the pilots watches). Really a beaut. Let''s just hope these watches stay solid and give the wearer a long life. This watch looks like a million bucks and everyone loves it. So far I like every Stauer watch I have but this one is a runaway favorite. Well I couldn''t find the guidelines for this review, but here goes with both barrels! Sadly I retired my Movado Astronic when faced with another $600.00+ overhaul; I''m comfortable but not nuts! I turned to Stauer for solice, took a gamble and I''m truly happy with this remarkable purchase. I can live with out a moon-phase dial and will turn to the newspaper or TV to get what had been available on my wrist. Days from 77 years old, I don''t move enough to keep self-winders going and I''m thrilled to have this timepiece keep going through my frequent naps. It has a super accurate quartz movement that runs like a CLOCK!Wish Stauer would tell me what kind of battery will be needed in the future AND instructions for operating the cool outer dial. Get one you''ll like it. MAN STAUER IS AWESOME!! wooo!!! A grand appearance of quality and class. Only negative are the leather stays of the band which must be treated gently when removing the watch. As a former Air Force Helicopter pilot, I love collecting flight watches.This is a must for looks, eye appeal and functionality and dependability. I dont know how they do it for the price!! 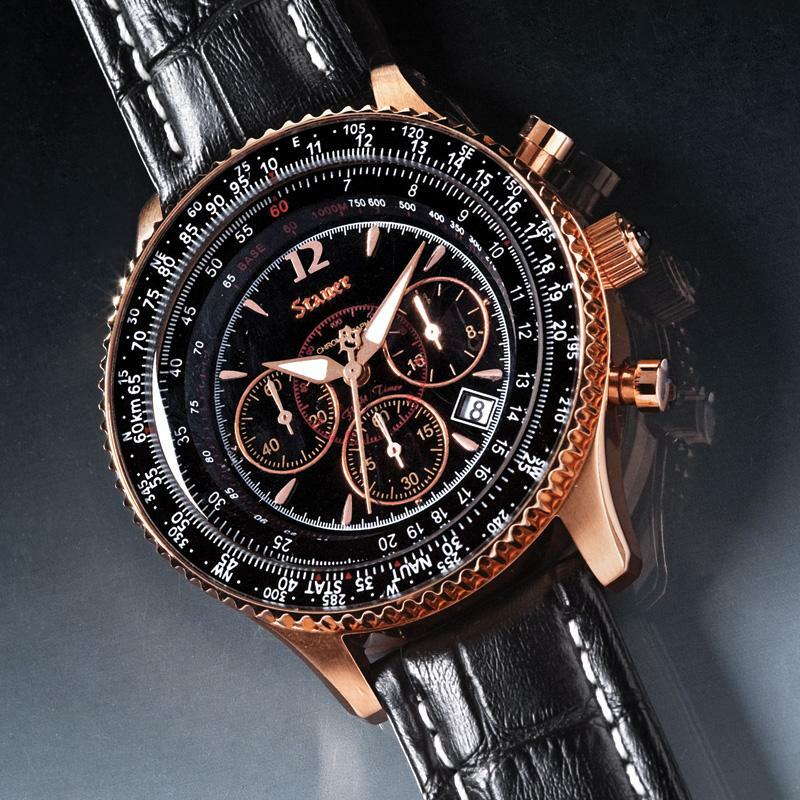 As a commercial pilot, I absolutely fell in love with this time piece when I first saw it. Great design, great looks, and it''s classy. I think it''s cool that a time piece can keep you on track, but also can figure out time-speed-distance calculations as well. Now if I can only find my trusty E6-B. A beautiful watch, very good looking, that keeps excellent time! I''ve received many compliments on it and enjoy alternating it with other wristwatches I own, including the Stauer Formula One watch much like it. You can''t go wrong buying this watch. My wife envies me these watches and wishes there was a women''s size version of it! This is my 3rd Stauer watch that I have bought and I am sure that I will buy more. I also bought the winder for 4 automatic watches and Everything seems to work great. I only received the winder 3 days ago along with this watch. This watch is awesome and can be worn for dress or casual. I notice that you also have it with a white face. What I would suggest is a silver case and black face that would also look great. For the money, I don''t think this one can be beat! It has a very classy appearance and works great as a dress watch. One of my favorites. This watch has been working since 2008 without a single battery change. 2008 to 2017, about nine years on a single battery and the watch is still accurate. It is a good formal watch, now I should note I own the white dial version I the flyboy. The chronograph second hand is slightly off center, but not that big of a deal. As a dress watch I wear it few and far between, but still is a great watch for it's price. And even if the battery did not last as long as it has I would still have been content with it. Great looking watch. Every time I wear it someone always says they like my watch, even strangers I don't know. Excellent timepiece, accurate, good looking and different looking than most every watch out there. The tachymeter function is unique. Love it. Ten years later, the crack French pilot faced a different kind of challenge: navigating the pitch black skies over the South Atlantic. Behind the stick of his aircraft, he soared across the time zones from Senegal to Brazil, setting the record for the world's first non-stop flight across the South Atlantic. We studied countless classic aviator timepieces to match the vintage styling and design. Our watchmakers updated the movement for the 21st century, making it even more accurate and reliable than the originals. 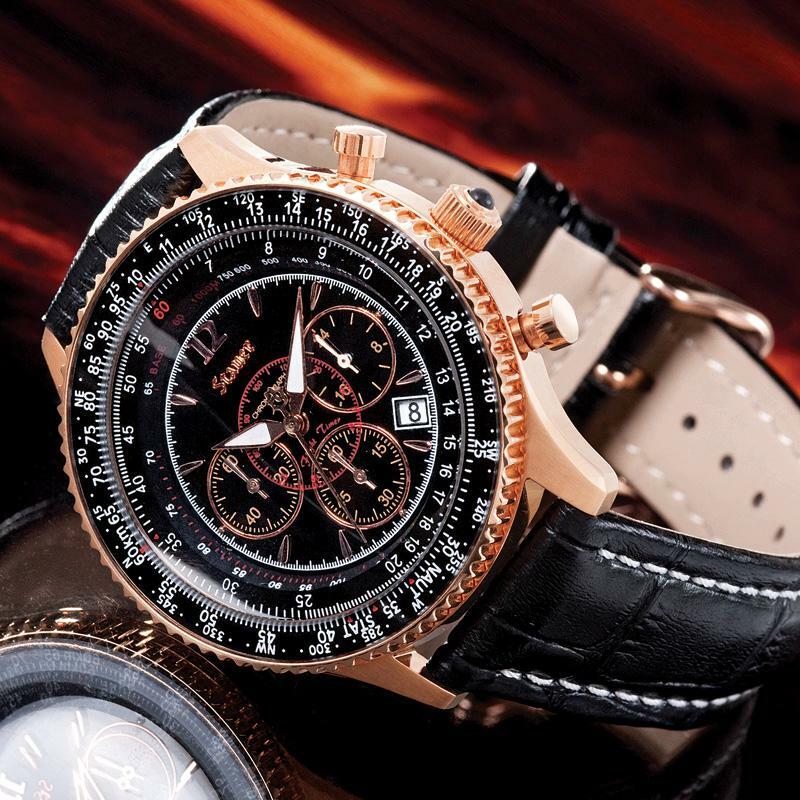 The Stauer Flyboy 1916™ features a stunning dial, set inside a case fused in warm rose gold. Three tachymeters and a movable bezel measure speed and ascent and the chronograph functions allow you to measure elapsed time. Interior complications mark minutes and hours and include a 24-hour display. The watch is water-resistant to 10 ATM and features a crocodile-embossed, genuine leather band. Every decent Ace should have one up his sleeve.